This article describes the overall boat design spiral process and its relationship to modern computer-aided design and engineering tools. Each major phase of design (design statement, conceptual design, preliminary design, and detailed design) is discussed in detail with examples of how the computer can effectively optimize the boat and speed the design process. Stephen M. Hollister. Web Site Snapshot: If available, above is a snapshot of the The Design Spiral for Computer-Aided Boat Design web site at http://www.newavesys.com/spiral.htm as it appeared when this site was added to the directory or last verified. Please Note that Boat Design Net has no involvement with the above web site; all content and images depicted in the above thumbnail are the property and copyright of The Design Spiral for Computer-Aided Boat Design unless otherwise noted on that site. 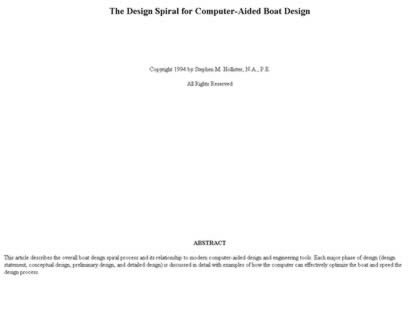 Description: This article describes the overall boat design spiral process and its relationship to modern computer-aided design and engineering tools. Each major phase of design (design statement, conceptual design, preliminary design, and detailed design) is discussed in detail with examples of how the computer can effectively optimize the boat and speed the design process. Stephen M. Hollister.